At nearly every wedding there are essential emergency items that always come in handy. While brides tend to have bridesmaids or someone with a handy kit, unfortunately the guys don't seem to have this organized as often. We could make lists for everyone in the wedding party (and maybe we will), but we though we would make this handy cheat sheet for the guys. In our two decades of experience, we find that all of these items are always useful to have on hand. 1. There never seems to be enough safety pins in the world on the wedding day. Guys, bring a handful. 2. It seems grooms do not get enough sleep (or are maybe up too late celebrating with with the guys) the night before the wedding. This can be trouble for a lot of reasons, but mostly can make a guy grumpy or have headaches on the wedding day. Carry - AND DRINK - a small bottle of water and your favorite head-ache remedy throughout the day to alleviate physical ailments that might put you in a bad mood. 3. Buttons always fall off at the worst times. For lost buttons and other sewing emergencies, pack extra buttons along with a small sewing kit with needles and mini scissors. Just bring the thread colors you need -- some that match the color of your shirt and some that match the color of your suit. 4. 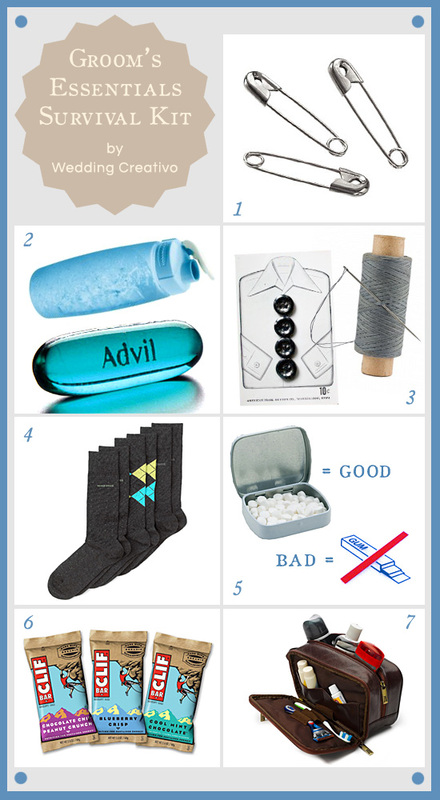 This is so unbelievably common -- guys often forget or have some other problem with socks. Bring a few extra pairs for the forgetful ones. Also, if appropriate, bring a change of socks and shoes for the reception. If the women will be throwing off their heels for flip flops before hitting the dance floor after dinner, the guys should be able to wear comfy shoes too. Check with the bride on this to see if it will be cool. If nothing else, pack a pair in the trunk for the ride home. 5. You'll likely be talking to far more people on your wedding day than a usual day. Carrying a small pack of mints in your pocket helps. Chomping on gum is bad, especially for pictures. You'll regret the strange faces chewing gum causes when you look at your pictures later. 6. With all of the heightened emotions, running around, and socializing that takes place on your wedding day, it is easy to run out of energy and get hungry. Couples often don't have time to eat a meal until late in the evening at the reception, so it is a good idea to keep a couple healthy snack bars handy to curb hunger pangs, headaches, bad moods, and foggy brain function. Nuts, energy bars, and fiber-filled apples are best. Less nutritious snacks like chips, candy bars or muffins are not as helpful to stave off hunger for longer periods of time, but if nothing else is around, they will do. 7. You'll likely see the girls going around with tote-bags, but grooms may feel more comfortable with a travel kit or mini luggage bag. Fill it with travel-size deodorant, tooth-brush, floss, mouth wash, comb, razors, and any of your other favorite toiletries. Along with your other wedding day essentials, you'll be sure to survive the typical kinds of emergencies that grooms face.